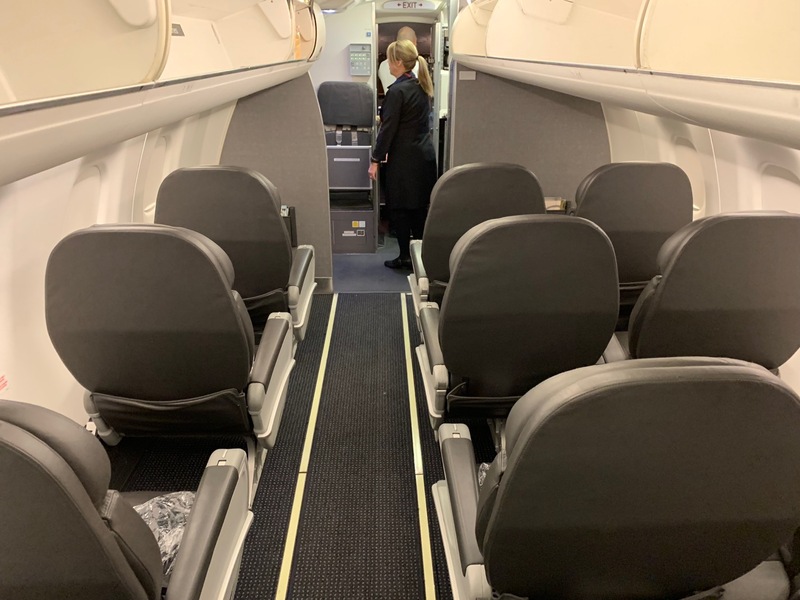 Although an onboard incident is my main takeaway from this flight, I greatly enjoyed personalized, friendly, and proactive service on an early morning flight from Seattle to Los Angeles on American. I booked this flight for 15,000 British Airways Avios. It was about $400 for a first class ticket and I figured I’d treat myself to the upgrade. Boarding began at 6:45 AM and the flight was very lightly filled. Both economy and first class departed with about half the seats open. A very friendly FA greeted me as I boarded…let’s address that first. I was so impressed by the service on this flight, especially in light of the constant (and generally accurate) attacks on AA mainline service. The flight attendant working first class was extremely attentive, addressed passengers by name, kept glasses full, and constantly monitored the cabin throughout the flight. The service was flawless. I know AA often has trouble offering pre-departure beverages. That was not the case on this subsidiary-operated flight. All drinks were free flowing and I was a bit surprised that so many around me ordered hard liquor at 6AM…it wasn’t just my high/drunk seatmate. I’ll note here that Compass Airlines, a regional subsidiary for American and Delta, still uses the old Northwest Airlines logo. I loved seeing it on the safety card. The first class cabin included 12 seats (four rows in a 1-2 configuration). I love the privacy and comfort of these seats, actually preferring this aircraft to many mainline aircraft. A sealed blanket was waiting in each seatback pocket. Breakfast was served after takeoff. Unlike the Alaska E175s, no ovens were present onboard so that meant a cold breakfast. But it was actually a tasty and certainly a hearty breakfast. The meal included granola with milk, grapes, cheese, yogurt, banana, and a cinnamon roll. I actually liked the “Fly Fit” yogurt most of all. It was from Holland and not too sweet. Coffee was horrible, so I stuck to water for most of the flight. A hot towel was offered before breakfast. Small, clean lavatory in the front of the plane that included Bigelow soap. Gogo wi-fi did not function. I was unable to connect the entire flight and tried on several occassions. We landed at LAX a half-hour earlier, sat for a half hour waiting for a gate, and ended up arriving in the remote terminal. The whole waiting for a gate then waiting for a bus process was so annoying and makes me thankful that United has generally figured out its gate problem at LAX. This was a brief, perfectly-satisfactory domestic flight. In many ways, I enjoy these larger regional jets more than mainline. Too bad the wi-fi did not work. Have you flown Compass Airlines? What was your experience? Next Article Air Canada Banishes Mother To Lavatory To Breastfeed? Nope. I honestly don’t think American realizes how despised that remote terminal is for regionals. I avoid any regional AA flights to LAX for that reason. As do many I know. And I am sure it’s why they are getting their butts handed to them on the Seattle to LAX market. How do they do hot towels with no ovens? Compass is my absolute favorite airline flying out of LAX. Both on Delta and AA, they fly E175s, which are the most comfortable economy experience in the US. Agreed. I have flown numerous times on the E175 planes to and from LAX. Service is always very professional and pleasant. Wish Compas would take over all of AA’s flights. 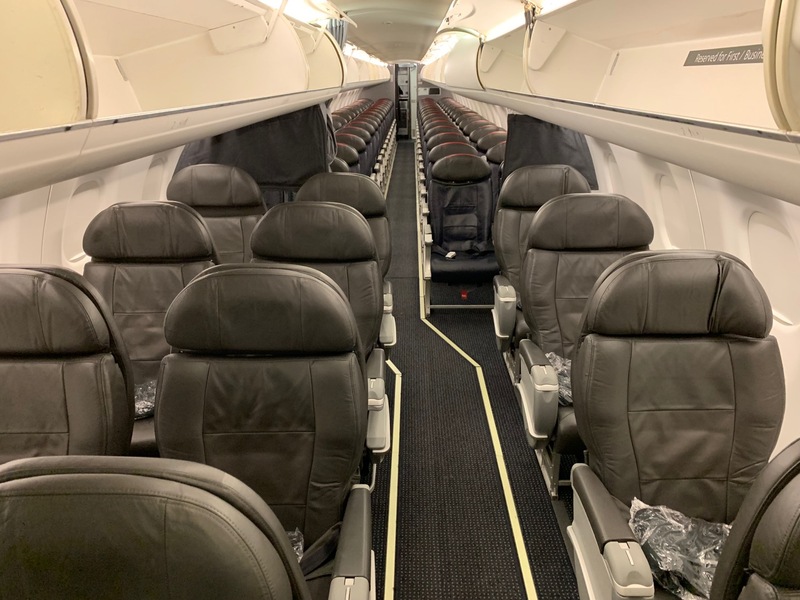 I recently flew in a Compass E-175 (for Delta) in first class from Sacramento to LAX. The service was excellent. It was a short mid-morning flight, so just snacks. The E-175 is a very comfortable plane, even in the back. Definitely my favorite small plane (I loath the CRJ’s). So far I’ve flown the Embraers on Sky West for both Alaska and Delta, and they both provided hot meals, so I’m not sure what you mean about the ovens. We have done this same flight (also on the E175) to and from Vancouver BC. In fact, we are doing it again this coming weekend. While the remote terminal is annoying, we see it as a minor inconvenience overall. The flight crew have always been great, we have no real complaints about this flight in and out of of YVR. Those single seats are great. I wish all small planes were this comfortable. Also to let you know, almost every day you can fly that route on Alaska on a 737 in F for $239, earn 2000 AS miles + elite bonus if you are AND you with an F domestic purchased ticket on Alaska you get lounge access as well. Maybe an option rather then using 15,000 AVIOS points. I would have gladly paid that over Avios, but pricing was much higher on the two early Alaska fights I needed. Had to be back in LA for a 10am appointment.